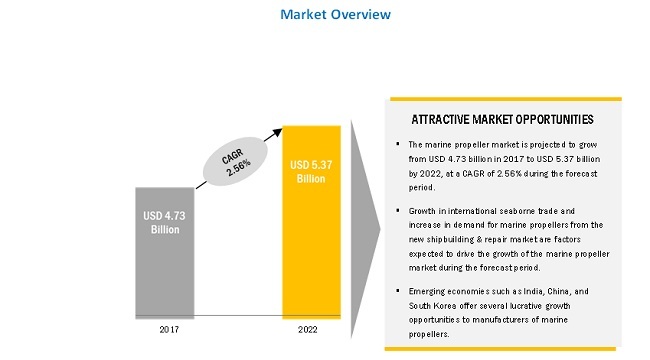 [176 Pages Report] The marine propeller market is estimated to be USD 4.73 Billion in 2017 and is projected to reach USD 5.37 Billion by 2022, at a CAGR of 2.56% from 2017 to 2022. The objective of this study is to analyze, define, describe, and forecast the marine propeller market based on type, application, material, end user, propulsion, number of blades, and region. 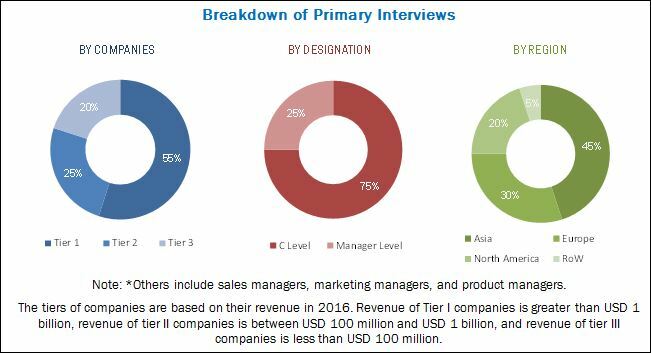 The report also focuses on providing a competitive landscape of this market by profiling companies based on their financial positions, product portfolios, and growth strategies as well as analyzing their core competencies and market share to anticipate the degree of competition prevailing in the market. This report tracks and analyzes competitive developments such as contracts, new product launches/developments, and research & development (R&D) activities in the marine propeller market. The base year considered for this study is 2016 and the forecast period is from 2017 to 2022. The marine propeller market has been segmented on the basis of type, application, material, number of blades, end user, propulsion, and region. Rolls-Royce (UK), Wartsila (Finland), Hyundai Heavy Industries (South Korea), MAN SE (Germany), and Caterpillar (US) are key manufacturers of marine propellers. Contracts, new product launches/developments, agreements, and acquisitions are major strategies adopted by key players in the marine propeller market. The marine propeller market is estimated to be USD 4.73 Billion in 2017 and is projected to reach USD 5.37 Billion by 2022, at a CAGR of 2.56% from 2017 to 2022. This growth can be attributed to an increase in international seaborne trade, the rise in the demand for recreational boats, and growth in maritime tourism. The report segments the marine propeller market based on type, application, and number of blades, propulsion, end user, material, and region. Based on application, the marine propeller market has been segmented into merchant ships, naval ships, recreational boats, and others. Based on end user, the market has been segmented into OEM and aftermarket. Based on propulsion, the marine propeller market has been categorized into inboard, outboard, sterndrive, and others. Based on number of blades, the market has been segmented into 3-blade, 4-blade, 5-blade, and others, whereas, based on type, the market has been segmented into propellers, thrusters, and others. Based on material, the marine propeller market has been segmented into stainless steel, aluminum, bronze, nickel-aluminum bronze, and others. The merchant ships segment is the largest application segment of the marine propeller market. The growth of the merchant ships segment can be attributed to the increasing use of merchant ships for commercial transportation. The merchant ships segment has been further categorized into cargo ships and passenger ships. Increase in trading activities and growth in maritime tourism has led to the rising demand for cargo ships and passenger ships, worldwide, which, in turn, is driving the demand for marine propellers. Based on region, the marine propeller market has been segmented into North America, Europe, Asia, and Rest of the World (RoW). The marine propeller market in Europe is projected to grow at the highest CAGR during the forecast period, owing to increasing investments in the defense sector and restructuring efforts undertaken by ship manufacturing companies in this region. Among all regions, Asia is the largest market for marine propellers. Over the past few years, this region has witnessed rapid economic development as well as growth of the manufacturing and energy sectors, thereby resulting in an increase in maritime trade. The rise in seaborne trade has subsequently led to an increase in the demand for ships that are used to transport manufactured goods worldwide. Thus, increase in the number of ships has contributed to the growing demand for propulsion systems and propellers in this region. China, South Korea, and Japan are key markets for marine propellers in the Asia region. The marine propeller market is anticipated to witness significant growth in the near future, primarily driven by growth in international seaborne trade and increased demand for marine propellers from the new shipbuilding & repair market. Increased navy budgets worldwide, rise in usage of inland waterways, and technological innovations in marine propulsion systems are key opportunities of the market. However, factors such as stringent environmental regulations and accident caused by propellers are restraining the growth of the market. Fluctuation in oil prices, shipping overcapacity, and low freight rates are key challenges of the market. Leading players in the marine propeller market include Caterpillar (US), Hyundai Heavy Industries (South Korea), MAN SE (Germany), Rolls-Royce (UK), and Wartsila (Finland), among others. Contracts and agreements are key development strategies that collaboratively accounted for more than one-third share of all developments between 2013 and 2017.